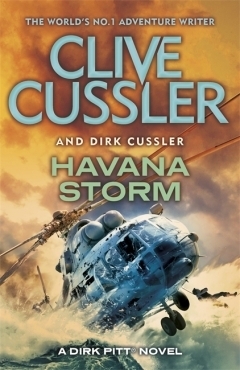 Havana Storm opening line: Sweat poured down the exhausted man’s face, cascading in heavy drops off his unshaven cheeks. Dirk Pitt is back again in this latest NUMA novel which has its beginning in 1898 and the destruction of the USS Maine. On a mission to discover what is causing toxic mercury plumes off the coast of Cuba, two seemingly unrelated stories collide. A political shake up is happening in the country and this threatens the lives of the people aboard the Numa vessel. Dirk Jnr and Summer Pitt’s holiday excursion turns into a near deadly experience when they stumble upon an amazing archaeological discovery. Can the crew of the Sargasso Sea save the lives of those threatened, and recover a mysterious stone from the Aztec era? Pitt’s children, marine engineer Dirk and oceanographer Summer, are on an investigation of their own, chasing an Aztec stone that may reveal the whereabouts of a vast historical Aztec treasure. The stone was believed to have been destroyed on the battleship Maine in Havana Harbour in 1898, bringing them both to Cuba as well – and squarely into harm’s way. These three are no strangers to dangerous situation… but none so dire as the one facing them now. This book was one of the many I read in December and as the norm with the Clive Cussler books, I learnt some interesting facts while enjoying a novel. I can highly recommend this as a book worth adding to your reading list. Thanks for your honest book review! I’m always looking for something interesting to read. And the older I get, the more I realize, I don’t want to waste time reading books that are crappy. In fact, I’ve started to not even finish books that just don’t work out. Used to feel guilty about this, not anymore! I also don’t feel guilty if I don’t finish a book!